This is a few shots I put together for a TV episode special called "The Fabric Of Time" which centered around the burial cloth of Jesus Christ that is the famous Shroud of Turin. This artifact has a very distinct ghostly impression found deep within the fibers of the cloth whose origin is controversial. 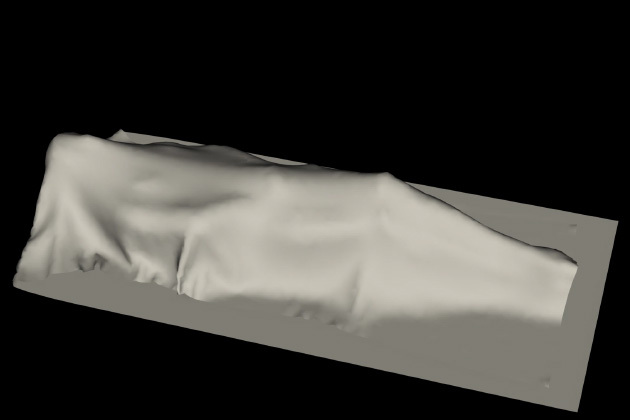 In this project I was responsible for creating a 3D model of the figure in the images and doing some cloth simulations depicting theories about how the impression was made. While working on this project I was amazed at the symmetry of the impressions and how perfect they fit with the 3D model I crafted. The impressions are not as if they were wrapped around the figure but rather as if the figure was photocopied onto them with parallel light. This 3D model was approved by all of the leading Shroud of Turin experts and approved by people with doctorates in this subject. The theories presented are documented in their doctoral thesis which this TV episode explores.